RIO DE JANEIRO, BRAZIL – The 2012 Festival do Rio, Rio’s international film festival continues to entertain and fascinate film lovers across the city for a second week with one venue offering behind the scenes views into movie production. The Pavilhão do Festival (Festival Pavilion) serves as the hub of the two week festival, as well as gives the public opportunities to mingle with members of the film industry. The Pavilhão do Festival (Festival Pavilion) serves as the hub for the industry during the festival, photo by Felipe Coasth/Festival do Rio. Located in the port zone of Centro, Armazém 6 (on Rua Rodrigues Alve) or Armazém da Utopia as its referred to, is a former warehouse now used for entertainment events. The 4,500 square meter building houses a screening room for the public presentations of Premiére Brasil and also hosts the Cine Encounter debates as well as RioMarket. 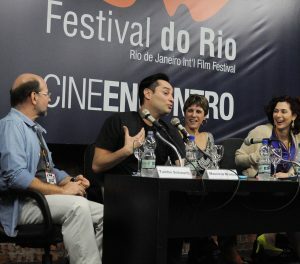 During the festival, every afternoon the Cine Encontro program brings Brazilian actors and actresses for fans to meet. On Thursday, October 4th actors Wagner Moura (“Tropa de Elite“), Lima Duarte (“A Busca”) and actress Mariana Lima (“Corel Encantado”) will be present. Also on the evening of October 4th Armázem da Utopia will host the festival’s American Day, which is an invite-only event. The program from the U.S Consulate of Rio de Janeiro, Câmera de Comércio Americana of Rio de Janeiro and LATC will begin with cocktails at 6:30 PM followed by a showing of Ben Affleck’s “Argo” at 7:30 PM. “We have had the pleasure of working with the Rio Film Festival in the last several years and we have witnessed the growth of this highly anticipated event,” Mark Pannell, Public Affairs Officer for the U.S. Consulate General in Rio de Janeiro told The Rio Times. Tuinho Schwartz, Mauricio Branco, Patricia Rebello and Patricia Faloppa discuss their documentary, ” Rio Anos ’70s” during a seminar at the Festival Pavilion, photo by Chesney Hearst. Many parts are open to the public including special programming for children featuring free movie screenings in a cinema room. Madagascar 3D will be shown on Wednesday, October 3rd, The Adventures of Tintin 3D on Thursday, October 4th and Cars 3D and The Avengers 3D on Saturday, October 5th. The full schedule can be found here. Upon entering the Armazém da Utopia visitors will be greeted by mannequins dressed in costumes from the recently concluded popular Rede Globo novela, Cheias de Charme. The shiny, colorful show pieces are the work of figurinista Gogoia Sampaio. The RioMarket section of the festival with its events mostly taking place in Armazém da Utopia, also provides background information about the inspirations and choices producers,directors and industry professionals make. As an industry insider section, RioMarket offers seminars, screenings, and master classes. On Saturday, September 29th the team behind “Rio Anos ’70s” spoke about their documentary competing in this year’s Premíere Brasil. They explained that it is a film about the marvelous city during the 1970s, a turbulent yet sensuous decade when Brazil was under dictatorship while Saturday Night Fever, disco and a gay movement grew. They also shared their personal experiences in ’70s during the intimate behind the scenes seminar. Many more insider industry events are ongoing at the pavilion with screenings of films, presented by actors and directors and others involved in their production. The 14th annual Festival do Rio will continue until October 11th, 2012.